Posted in History and tagged Clery's, clock at 12:24 pm on January 9, 2019 by Chompsky. Please bring back beautiful O’Connell Street as it was. One of the finest streets in Europe. Lovely pic. Thanks for sharing. Yeah, bring back Nelson’s Pillar. We need something British to blow up after Brexit. … a bit like having to dig up Ollie Cromwell from his grave, behead him and then hang him when already dead… and put his head on a spike. What? Beheaded and then hung? Are you sure it wasn’t the other way around? 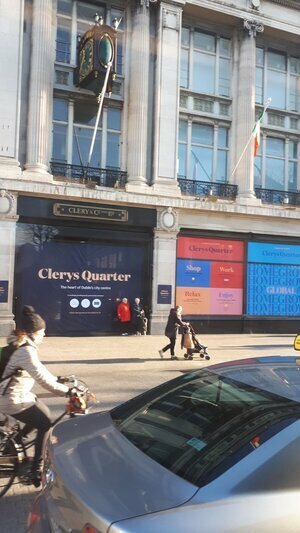 It’s two people standing at the old Cleary’s in O’Connell Street. How do you know they are waiting on anyone? Looks like they’ve stopped for a wee breather, if you ask me..
How long did you wait before realising she said it as a joke? Has anyone ever thrown a sausage up O’Connell Street?